In this part 1 of this woodworking project, I'll show you how to build the modern coffee table tops out of Hard Maple. If you'd like to keep this build more budget-friendly, you could build the tops out of 2x10s from the home center. Part 2 will be out next week, and will cover welding the steel legs and then assembling the table. Let's get started! The links below are affiliate links, they cost you nothing and help to support my content. Thanks! I built this project out of 8/4 or 2” thick Hard Maple. If you want to build these tables, it’s best to look for boards that are at least 8” wide to reduce waste. If you wanted to build this on more of a budget, 2x10s from your local home center would be a great, inexpensive option as well. You could process them in basically the same way and end up with a similar table. The first step in breaking down the Maple was cutting the boards into more manageable pieces on the miter saw. Since the final table size was 29” by 29”, I cut my pieces to around 30” long, leaving enough extra length for trimming to final length later on. These boards were relatively flat and were skip planned at the mill, so next I jointed one edge on the jointer to square it up with the face of the board, then ripped the boards in half at the table saw. These boards were a little over 8 inches wide, so I cut them to about 4 inches wide at this point. The final thickness of the tops ended up at around 3 ¾”. With all of the pieces cut to their rough size, I then squared them up on all sides, starting on the jointer. I flattened one face and then squared up one edge to that face before moving on to the planer. At the planer, I smoothed out each board, bringing them down to their final thickness of roughly 1 ¾”. After each pass through the planer, I checked the faces of the boards and flipped the boards that already had one smooth face. By taking relatively even amounts off of each side of the boards, the boards have less pronounced bowing due to the fresh surfaces being exposed. Once both faces of all the boards were completely smooth, I ripped them to final width at the table saw. This ended up at about 3 ⅞”. While I’m ripping, let’s take a second to talk about the sponsor of this week’s video, SawStop. I’ve had a SawStop table saw in my shop for about six months, and I would never go back to another table saw. The added safety and piece of mind when I’m working in my shop alone is unparalleled. Now through the end of April 2017, SawStop is offering a free upgrade on new Professional Cabinet Saw purchases. In the US and Canada, each customer who purchases a new Professional Cabinet Saw will receive one of two available accessories, the Overarm Dust Collection OR the Integrated Mobile Base, each worth $199.00 USD. SawStop saws never go on sale, so if you’ve been on the fence, jump on this promotion and get $199 of accessories free of charge. To learn more, click here. With all of the boards at the final size, I cut them all to their final length at the miter saw. I squared up one end of the board, flipped it around, then cut the board to its final length, roughly 29”. Having a stop block on your miter saw is extremely helpful here, since there are a lot of cuts to be made. Next, I arranged the board how I wanted them in the final top, making sure any imperfections were facing down. I also tried to arrange the colors of the boards to look fairly similar. To make sure I put the boards back in the same orientation, I drew a triangle across the entire face. One of the design elements of these tables are the bolts and nuts recessed into the sides of the table. There were a lot of ways to do this, but I decided to use all-thread running through the entire length of the tops. To make sure all of my holes lined up properly, I set up a stop block on my drill press. For the ¾” washers I used, I needed a 2” hole to recess the washer and nut in. I drilled these first, only on the two outside faces of the table. Next, for the ¾” all-thread, I drilled 1” holes in every piece. This extra wiggle room helped to account for any slight errors in the drilling. This was a ton of drilling and my drill press got quite the workout that day. Next, I rounded over the edges of all of the holes. This helped to remove any of the hanging pieces of wood that could have caused gaps in the glue up. To help keep all of the boards aligned during glue up, I cut biscuit slots in each board. This really helped keep the top mostly flat during the glue up. For the glue up, I used a foam roller to get an even layer of glue of the face of the board, added the biscuits, and then repeated this. There were 17 boards on this glue up and I still managed to get them in the clamps in under 10 minutes. Glue ups are definitely a lot less stressful when you plan ahead. Once the glue dried, I roughly flatted the bottom of the table using a low angle jack plane. I don’t have a jointer plane, otherwise I would have used that here. Basically, the longer the plane, the better here. With the bottom roughly flat, I took the top to the drum sander and got it totally flat. If you don’t have a drum sander, you could use a belt sander and a straight edge to accomplish the same thing, or, if you’re hand plane skills are good, you can flatten the top with a plane. Once the top was completely flat, I squared up the edges of the top. I used a track saw, but a circular saw with a straight edge would work just as well. Since the tops are so thick, I had to make a pass on one side, flip the top, and make a pass on the other side. Take your time laying out your marks and you could end up with a fairly even surface, but you’ll probably need to clean it up. I used the low angle jack plane again for this. With one side squared up, you could do the same on the other end of the table to get it perfectly square. Next came lots and lots of sanding. Hard Maple is pretty hard stuff, as the name implies, so sanding takes awhile. Drawing a pencil line across the whole surface can help let you know when you’ve sanded the whole surface evenly. I started with 80 grit and worked my way up to 180. 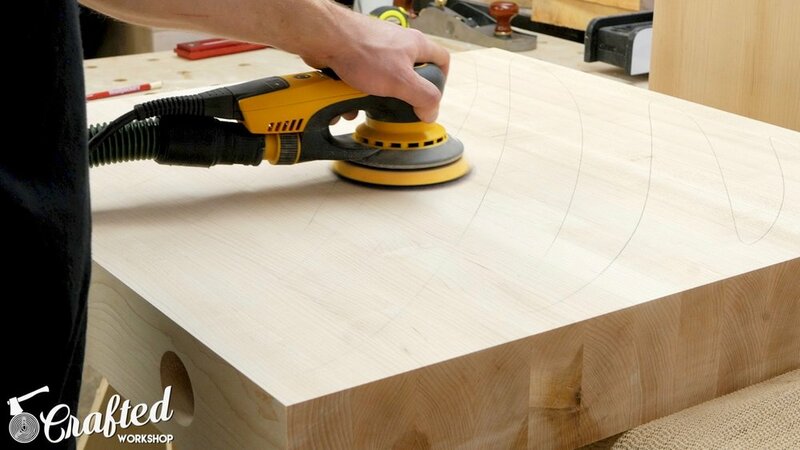 Before sanding to my final grit, I rounded over all of the edges of the table tops with a ⅜” radius roundover bit. This really gives the tables a nice look and, if you bump into an edge with your knee or shin, it’ll hurt a lot less that if the edges were left sharp. I smoothed out all of the roundovers with 180 grit, and also added a ⅛” radius roundover to the recesses for the bolts and sanded those as well. Once sanding was done, it was time to apply finish. I went with a water based polyurethane for this table, since they’ll see a good bit of wear with coffee cups, drinks, etc. Also, big shoutout to my friends at the Modern Maker podcast. They’re a new podcast that is absolutely killing it, definitely check them out if you haven’t already heard them. I applied four coats, sanding with 400 grit in between. With the finish applied, the table tops were done! Stay tuned for Part 2 which will be published next Tuesday, April 11th. I'll replace this with a link to Part 2 when it's up. If you'd like to be notified when Part 2 is published, sign up for my email newsletter below, or subscribe to my YouTube channel here. See you next week!